After the main floor system is completed, and prior to the framing of exterior walls, careful consideration should be given to any special items which need to be installed. 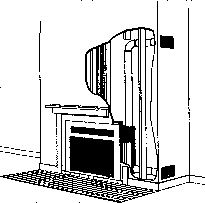 One-piece bath or shower units and other large fixtures or equipment that cannot pass through door or window openings must be placed within the building before walls are erected. Similarly, exterior £ chimneys and chases may also have to be completed before walls are [■ framed. In some cases, such as internal masonry fireplaces supporting vB roof structural members, it is necessary to have these constructed v, prior to wall framing in order to avoid interfering with this work. The following items pertaining to the planning and coordination of trades prior to wall framing should be reviewed before starting any construction. Review plans and specifications carefully to identify any special items which have to be installed prior to wall framing. I -* Order and arrange for delivery of these special Items well in advance of j wall framing to avoid delays. I Coordinate with trades responsible for constructing fireplaces, chimneys | and chases to maximize productivity and minimize conflicts. | items are substituted with less suitable items, or altogether omitted from j the house. added. This second top plate usually laps the first plate at the corners and partition intersections and, when nailed in place, provides an additional tie to the framed walls. Where the second top plate does not lap the plate immediately underneath at corner and partition intersections, these may be tied with 0.036 in. (0.91 mm) galvanized steel plates at least 3 in. (75 mm) wide and 6 in. (150 mm) long, nailed with at least three 21/2 in. (63 mm) nails to each wall. Multiple stud arrangements at exterior corner. 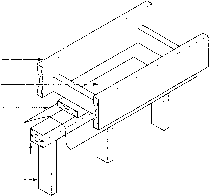 In the two-stud arrangement, a plasterboard clip is used at the corner for support. 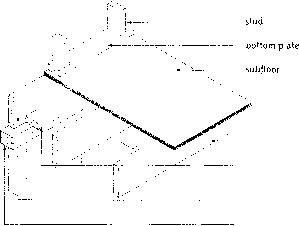 Multiple stud arrangements at the intersection of an interior partition with an exterior wall: (A) two studs used; (B) bracing or blocking is used; (C) the partition is attached to exterior wall after drywall has been installed; (D) insulation must be installed before sheathing is applied. 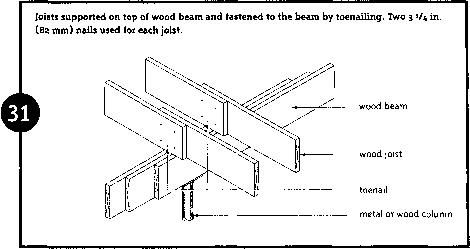 Horizontal nailing support for interior finish. Nailing support provided by 2 in. (38 mm) lumber nailed to top plates with 3 in. (76 mm) nails at 12 in. (300 mm) on centre. End-wall framing and nailing support for interior finish using platform construction method. wood nailing support for interior finish partitions, single studs may be used at door openings. The top of the opening may be bridged with a single piece of 2 in. (38 mm) lumber the same width as the studs. These members provide a nailing support for wall finish, door frames and trim. Multiple-stud post made up of at least three studs, or the equivalent, is generally used at exterior corners and intersections to secure a good tie between adjoining walls and to provide nailing support for the interior finish and exterior sheathing. Corners and intersections, however, must be framed with at least two studs. Figures 43 and 44 illustrate commonly used exterior corners and partition intersections. Nailing support for the edges of the ceiling finish is required at the junction of the wall and ceiling where partitions run parallel to the ceiling joists. 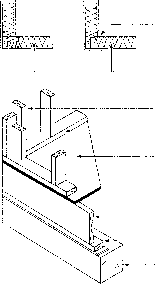 Figures 45 and 46 illustrate the types of nailing support commonly used.